When alumni, staff, faculty, administrators, friends and family contribute to CSUN, they contribute to research funding, scholarships, facility construction and many other projects that lend to the excellent education and environment at CSUN. The Division of Student Affairs offers a number of opportunities for individuals interested in contributing. You may support the university by enrolling in an alumni program, making a cash or in-kind contribution, donating a gift in your name or in honor of a loved one, creating an endowment, contributing to existing scholarship endowments or by offering direct support to the Division of Student Affairs. Every contribution is deeply appreciated and vital in shaping the future at CSUN. To contribute, choose one of the following options. Donating online is an easy, convenient and secure way to make a contribution to CSUN. Fill out the Faculty/Staff Payroll Deduction Authorization form and submit it to the CSUN Foundation, mail drop 8296. For more information, contact the Foundation at (818) 677-4657. For more information about giving to CSUN, please contact Jerry De Felice, Student Affairs Development Officer, at jd@csun.edu or (818) 677-3935. Thank you in advance for your generosity. Jerry De Felice has served as Director of Development for Division of Student Affairs since March, 2008. De Felice has an extensive background in university recruitment, advisement, counseling, public relations, management and strategy. De Felice's current responsibilities include developing, implementing, and overseeing a comprehensive fund development program aimed at identifying, qualifying, cultivating, soliciting and stewarding major gift prospects and donors. De Felice began his association with CSUN in 2000 when he was named Regional Coordinator/Outreach Counselor for Student Outreach and Recruitment Services. His responsibilities included creating and presenting CSUN and CSU early outreach, admissions, financial aid, and motivational workshops for alumni, students and parents to more than 100 elementary, middle school, high schools, and community colleges in Los Angeles and Ventura Counties. De Felice earned his B.S. in Business Administration and a Master’s degree in Educational Administration from CSUN. (NORTHRIDGE, Calif., May. 14th, 2010) ― Cal State Northridge Vice President for Student Affairs Terry Piper passed away Thursday evening at St. John's Hospital in Santa Monica after a battle with melanoma surrounded by his wife, children and other family members. He was 57. California State University, Northridge President Jolene Koester called Piper's death a "grievous loss for the entire campus community." "No one exhibited greater devotion to the success and well-being of students," she said in a statement to the campus community. She said that during Piper's tenure, he re-shaped Northridge's Division of Student Affairs to align it with the most current thinking and practices of the student affairs and services disciplines. "This progressive approach placed the focus of the division's mission and priorities on students and student learning, and aligned its focus on the students' work in the classroom, the university's instructional mission and the totality of the academic and college experience." "I have learned during my experiences in higher education leadership that a vice president may have responsibility for one area, but those vice presidents who truly excel are those who understand and assume the perspective of the whole university," Koester said. "Dr. Piper became this kind of vice president, and his leadership, contributions, knowledge and friendship were respected and valued across the campus." Koester appointed Piper vice president for student affairs in January of 2001. Prior to joining the Cal State Northridge community, he had been assistant vice president for student life at the University of Nevada, Las Vegas, for more than six years. Prior to that, he was director of residential life at the university. His other previous experience included appointments at the University of Iowa and Ohio State University. He began his professional career as a residence hall director and area coordinator at Ohio State University. Piper earned his bachelor's degree in secondary education from Pennsylvania State University, a master's in college student development and higher education from the University of Iowa and a Ph.D. in educational policy and leadership from Ohio State University. Keeping true to his commitment to education and scholarship, Piper held a faculty appointment in the California State University, Northridge's Department of Educational Psychology and Counseling and regularly taught classes during the academic year. He was widely respected in his field, and his innovations and ideas—such as a residence hall community standards model—have been widely adopted across the nation. He published and presented his work extensively, and was a national leader in his field. Piper is survived by his wife, Carolyn, daughter, Dana, and son, Matthew. A university memorial service will be held on Monday, May 17, at 2 p.m. on the Manzanita Hall Lawn near the southwest corner of the campus near Nordhoff Street and Etiwanda Avenue. In lieu of flowers, the family asked that donations be made to the Terry D. Piper Endowment at California State University, Northridge. John W. Gorman believed in the power of compassion and science to change lives, and he exemplified his belief in the choices he made throughout his life. Gorman was born on August 10, 1925, in St. James, Minnesota, and raised in Sioux Falls, South Dakota. He entered the service in the U.S. Army at age 17, serving as a U.S. Army Ranger during World War II. His generosity and compassion were revealed in everything he did. While in training and waiting to be shipped overseas to Europe, Gorman helped tutor other soldiers in advanced math courses. In letters home to his parents, Gorman spoke of sharing his care packages with fellow soldiers who had not received anything from home. Gorman was honored for his bravery and service, being awarded both the Purple Heart Medal for wounds suffered in combat, and the Bronze Star Medal for meritorious service. Gorman continued his education after the war, using the GI Bill to help fund his bachelor’s degree in chemistry from the University of Minnesota, where he met and married his wife, Ramona. While working toward his Ph.D. in chemical engineering at University of Minnesota, however, tragedy struck: He contracted polio and lost all use of his legs. Gorman was unwilling to give up though, and signed up for controversial new rehabilitation treatments at the university that had been developed by Australian nurse Elizabeth Kenney, which consisted of rehabilitating muscles damaged from polio through physical therapy rather than the more conventional use of leg braces and immobilization. He was an exemplary patient throughout the sometimes-grueling process, regaining the complete use of his legs and earning his Ph.D. in 1955. Gorman had a long corporate career as a chemical engineer and statistician at Amoco Oil. He shared his love of science with his four children as he led them on nature hikes and fossil hunting trips. He passed away at the age of 82 from mesothelioma as a result of asbestos exposure. It is only fitting to honor Gorman’s legacy of helping others by establishing the John W. Gorman Endowment and Scholarship for a student pursuing a degree in science. Read more about Joan A. Lamb. (NORTHRIDGE, Calif., Feb. 1st, 2010) ― Temma Willey, chair of Cal State Northridge's Department of Cinema and Television Arts, announced today that the university has received a $1 million pledge from an anonymous donor who asked that the money be used for scholarships for students in her department. The gift will be used to create the Scott M. Weiss Memorial Scholarship Fund and the Scott M. Weiss Memorial Scholarship Endowment in honor of a cinema and television arts alumnus and entertainment industry professional who was killed in an automobile accident in July 2008. "This gift is not only generous, but inspiring," Willey said. "Scott Weiss' memory will be both an encouragement and a standard for a talented, creative and enterprising student to cross the bridge from school to his or her professional life. The gift truly is wonderful." Scott M. Weiss Scholarships will be awarded to cinema and television arts students who meet the university's financial need requirements and demonstrate promise in their major measured by their passion, commitment, creativity and effort. A recipient must be at least a sophomore and maintain a 2.5 or higher grade point average. The first scholarship is expected to be awarded later this year. Karen Kearns, associate dean of CSUN's Mike Curb College of Arts, Media, and Communications, had Weiss as a student in fall 2000. "Scott was in my single-camera television class," she said. "He and his group created a wonderful, five-minute piece called ‘Silver Lining.' It was about a little girl who was hit by a car and killed. Her organs were donated and the family met the little girl who received their daughter's heart. It was very touching. It also was the first time one of our television projects won a CSU Media Arts award. Scott was the editor on that team. "He was a great student. He was funny and he worked really well with his group," Kearns recalled. "He just added so much to the team and its ability to create this wonderful story." Kearns said she was "touched" that an endowment for cinema and television arts students was created in his honor. "It is so difficult to think that a student this young has left us," she said. "Yet, his legacy will live on in the work of these other students he is able to help." Scott Weiss transferred to Northridge in 1999 after having completed his general education requirements at Pierce and Valley Colleges. He enrolled in what was then the Radio-Television-Film Department with an eye on a career in the entertainment industry. During his final year at the university, Weiss obtained a much sought-after internship with a post-production company, earning credits toward his major at the same time. When he graduated in 2001, the company offered him a one-year contract to edit film coverage of the Salt Lake City Winter Olympics. In 2003, Weiss was hired by RIOT, a Santa Monica-based post-production company, to work exclusively on the company's contract with the Fox Broadcasting Company. His editing skills were used to create promos for upcoming movies on the FX cable channel. Pleased with his work, Fox hired Weiss as an in-house editor in 2006 when it ended its contract with RIOT. Two years later, on July 12, 2008, Weiss was killed in a automobile accident. He was 32. Cal State Northridge's Department of Cinema and Television Arts, housed in the Mike Curb College of Arts, Media, and Communication, is well respected by those in the entertainment industry, who frequently guest lecture and teach in the program and regularly hire its graduates. Alumni of the program have gone on to hold key positions in the entertainment industry-from writing and directing feature films to creating innovative shows for television and other media. California State University, Northridge has more than 33,000 full- and part-time students and offers 66 bachelor's and 53 master's degrees as well as 28 teaching credential programs. Founded in 1958, CSUN is among the largest single-campus universities in the nation and the only four-year public university in the San Fernando Valley. The university serves as the intellectual, economic and cultural heart of the Valley and beyond. (NORTHRIDGE, Calif., Sep. 10th, 2012) ― Linda Dozoretz loved the rock 'n' roll of the 1960s and was a skilled public relations professional with a knack for corporate and crisis communications. She was also a proud California State University, Northridge alumna. When Dozoretz died two years ago, she bequeathed more than $65,000 for the creation of a scholarship endowment at her alma mater. The scholarship, which was established in the memory of Dozoretz and her parents, Eileen and Ralph Dozoretz, will support an aspiring artist, actor or creative writer. The first Linda Dozoretz Scholarship will be awarded in fall 2013 to a student majoring in art, cinema and television arts, communication studies, journalism, music or theater in CSUN's Mike Curb College of Arts, Media, and Communication. "These kinds of resources are particularly important to our students in this current environment," said William Watkins, CSUN's vice president for student affairs. "One of the most useful ways alumni can support our students is through the gift of scholarship. An endowment such as this will support our students for years to come, and serves as a living legacy of the alumnae who created it." Lynn Weiss, director of communications for USA Network and a close friend of Linda Dozoretz, said the scholarship is a fitting tribute to her friend. "Linda was one of the most generous individuals I knew," Weiss said. "She truly cared about people and always made sure to take care of others. This donation by Linda to CSUN is a perfect example of her giving nature and her belief in helping young people achive their goals." The Linda Dozoretz Scholarship will be awarded to a third- or fourth-year student in financial need with a minimum GPA of 2.8 and who has contributed time and/or talent to a nonprofit organization or an advocacy group. Eileen Dozoretz was an avid amateur painter who took up art in her adult years. Ralph Dozoretz was a lifelong skilled craftsman who made a living in restorative woodworking. Linda Dozoretz, a native Los Angeleno, graduated from what was then San Fernando Valley State College in 1971 with a degree in English. While she was in college, she took a part-time job for a publicity agency and quickly discovered that public relations was the career for her. Over the years, she worked for such agencies as Ruder-Finn and Guttman & Pam. Dozoretz spent her longest time with Rogers & Cowen, where she was president of four divisions and reported to both Warren Cowan and Henry Rogers. While at Rogers & Cowen, she helped established the book, advertising and special project divisions. Friends said Dozoretz, a successful publicist, never stopped marveling at the "incredible life experiences" her career provided. Her long-time clients included Academy Award- and Grammy-winning composer Burt Bacharach, Martina Navratilova, Rosemary Clooney, Music Theatre International, the American Film Institute and Doris Day. Dozoretz served as executive director of the nonprofit Doris Day Animal Foundation. Beginning in the 1980s, Dozoretz worked on crisis public relations campaigns for hundreds of celebrities, entertainment industry productions, companies and nonprofits. At the time of her passing, Dozoretz was teaching a class on public relations for nonprofit organizations at UCLA Extension. California State University, Northridge is a regionally focused, nationally recognized university serving more than 36,000 full- and part-time students in the San Fernando Valley and surrounding areas. Founded in 1958, Cal State Northridge is among the largest universities in the nation and is ranked among the top universities for bachelor's degrees awarded to minority students. It has nine colleges and more than 2,000 faculty members who teach courses leading to bachelor's degrees in 69 disciplines, master's degrees in 58 fields and doctorates in education and physical therapy, as well as 28 teaching credential programs. Continuously evolving and changing to meet the needs of California and the nation at large, the university is home to dozens of acclaimed programs where students gain valuable hands-on experience working alongside faculty and industry professionals, whether in the sciences, health care and engineering or education, political science, the arts and the social sciences. CSUN’s education community lost a guiding light with the untimely passing of one of its brightest stars, Ludim Seja De Manzano. The former director of Student Outreach and Recruitment Services passed away on Sept. 6, 2003, after a long battle with cancer. Ludim was known throughout the San Fernando Valley as a woman passionately committed to providing access opportunities for countless families. She positively affected thousands of young people's lives for more than two decades of her career. She received her undergraduate degrees in English and Spanish and a master’s in educational administration from CSUN, the university where she would eventually become one of the most respected and valued administrators. As the director of Student Outreach and Recruitment Services, a department she helped build, Ludim was an inspiration to hundreds of college-bound students and their families. Ludim understood the value of higher education for underserved and underrepresented families, and saw the benefit of early outreach. She quickly became an advocate, working with younger children to increase their awareness of college and inspiring them to strive for higher education. In honor of Ludim Seja de Manzano, the Division of Student Affairs is proud to announce the Ludim Seja De Manzano Scholarship Endowment. We would like to personally thank Raquel and Ralph Baca, close friends of Ludim, and Florentino Manzano for hosting an event to honor Ludim. They opened their hearts and home on Ludim’s birthday, Dec. 23, 2006, and Ludim's family and friends raised the required amount to establish an endowment that will continue to honor her. Their generous contributions will allow us to continue Ludim's legacy by awarding scholarships to CSUN students. (NORTHRIDGE, Calif., Nov. 5, 2007) — Cal State Northridge senior Corinne McClane was a good student and the type of person who was there when her sorority sisters needed a friend. She always had a word of support for her clients at the gym where she worked. And she was never too busy to take her mother's long-distance calls, even when the topic was something as trivial as choosing the right pair of jeans. "She was just a good person overall," said her mother, Virginia McClane of Los Gatos. "You'd like to think that about your children—that they're good people—but you never really know until other people tell you. After she died, people just came from everywhere to tell us how much they appreciated her." Corinne McClane was killed at age 22 last year by a hit-and-run driver while crossing Wilshire Boulevard in a marked crosswalk in the Miracle Mile area of Los Angeles. In her memory, Virginia McClane, her husband, Les, and son, Keith, have established a $25,000 endowment at the university. The money will be used for scholarships for members of Corinne's sorority, Kappa Kappa Gamma. McClane said her daughter didn't have to work while she attended CSUN. Her job at the gym, Curves, was just for extra spending money. "Corinne was very aware of how lucky she was. She would talk about some of her sorority sisters having to work part-time jobs to support their education and sorority fees," McClane said. "Hopefully, this scholarship will give a boost to some deserving young lady and ease her struggle a little." CSUN Vice President for Student Affairs Terry Piper called the endowment "a wonderful way to honor Corinne as well as the values of the sorority to which she was so dedicated. Corinne served as treasurer, secretary and 2006 president of Kappa Kappa Gamma." "Kappa Kappa Gamma emphasizes academic excellence, philanthropy and community service—the values Corinne lived by," Piper said. "The Corinne McClane-Kappa Kappa Gamma scholarships will promote strong commitment to the sorority's values of it members." McClane said soliciting donations for the scholarship endowment has been a way to channel her energies since her daughter's death in March 2006. "It's really kept me busy for the past few months," said McClane, a member of Compassionate Friends, a support group for people whose children have died. "I did nearly everything myself. The only thing was that while I was printing the donation cards, I had to keep them face down because I'm just not ready to look at my daughter's picture just yet." "I'm not in denial about her death, more like avoidance," she said with a rueful laugh, adding that her house is still full of pictures of Corinne, only as a child, not an adult. "Current pictures are just too hard for me right now. I don't want to be reminded that my daughter's not with me." Virginia McClane said Corinne, a kinesiology major, knew while she was in high school that she wanted to do something in sports medicine, possibly becoming a credentialed personal trainer or a physical therapist. "She was very lucky that way. She had high standards and knew what she wanted to do. She was talking about going to graduate school for physical therapy before she died," McClane said. Corinne had already finished her kinesiology degree requirements at the time of her death. Kinesiology chair Carole Oglesby personally delivered Corinne's diploma to her family in time for her memorial service. "We buried the diploma with Corinne. That degree would have meant so much to her," McClane said. Corinne was close to her family. McClane said her daughter thought nothing of driving to the San Jose area for a visit home on the occasional weekend or during the holidays. Corinne has just been home for a visit and was planning another visit at the time of her death. "I was really beginning to enjoy my daughter as an adult," McClane said. Corinne would often give her advice about make-up or fashion. "Sometimes I'd be in a department store and just call her for advice on something I was considering buying, like a pair of jeans," she said. "I always seemed to catch her while she was in a restaurant with her friends. But she didn't mind". "Who would have thought that something this drastic would happen to your daughter? It's not something you worry about when she's only 22," McClane said. The first scholarship in Corinne McClane's name is scheduled to be awarded in spring 2008. For more information about the Corinne McClane endowment or on how to contribute to it, contact Jerry De Felice, development director for Cal State Northridge's Division of Student Affairs at (818) 677-3935 or via e-mail at jd@csun.edu. 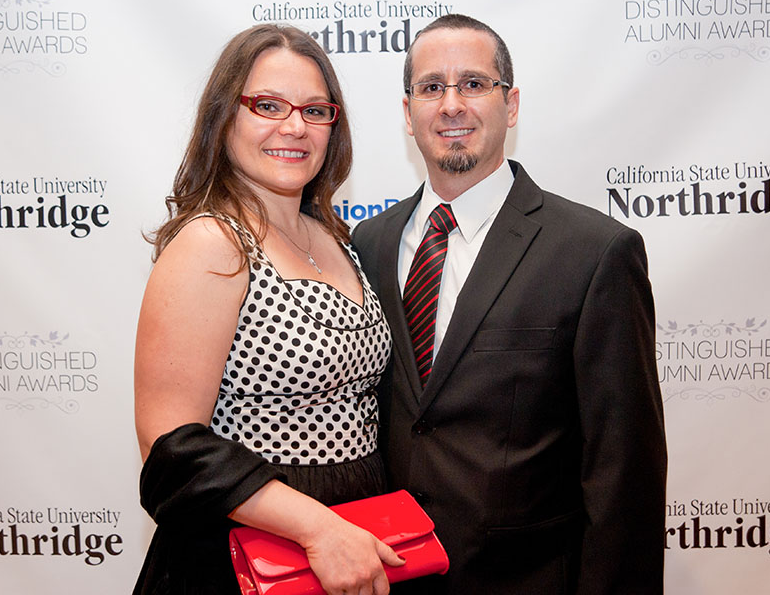 Donors Ray and Adina Calnan attend CSUN's annual Distinguished Alumni Awards. Photo courtesy of Ray Calnan. CSUN alumni Adina and Ray Calnan have a personal understanding of the unique challenges faced by young immigrants to the U.S. At the age of 15, Adina '04 (Accountancy), '04 (Finance), M.S. '17 (Accountancy) immigrated to the United States from Romania; at the age of three, Ray '03 (Finance) immigrated to the U.S. Thanks to California State University, Northridge, they also understand the unique, life-changing power of higher education. The couple recently established an endowed scholarship at CSUN, the Calnan Family Dreamers Scholarship Endowment, to assist immigrant students pursuing higher education. They chose to donate to CSUN because, as undergraduates, they discovered a student body that mirrored their own families and communities, the couple said. "I saw many students who were like me," Adina said. "As an immigrant, there are many hurdles that you encounter. While many students face financial struggles regardless of legal status, immigrants are also facing a language barrier and adapting to a new culture. I understand these hurdles, as I have faced them myself." "We wanted to donate to CSUN because its students often need more resources, especially Dreamers," Ray said. "Why not allow [Dreamers] more opportunity for a higher education?" It's estimated that 1,400 CSUN students live with undocumented immigrant status. Many of these young people came to the U.S. as children, with parents or other relatives who dreamed of starting a new life, a better life, in this country. Those who fall under the provisions of the DREAM (Development, Relief, and Education for Alien Minors) Act are referred to as Dreamers. The annual distributions from the Calnan Family Dreamers Scholarship Endowment will provide at least one annual scholarship to CSUN students who have AB 540, Deferred Action for Childhood Arrivals (DACA) or other undocumented status. Additional criteria may be used to determine scholarship recipients, including continuing education, scholastic achievement (a minimum 2.5 grade point average), demonstrated financial need and demonstrated exceptional leadership and community service. Students also need to have completed at least one personal finance course at the university or be working on a degree in the David Nazarian College of Business and Economics. Ray and Adina credit CSUN for providing an education that helped them advance in their professional careers. In 2003, Ray earned his bachelor's in finance. In 2005, Ray earned his master's in international business from California Lutheran, and for 10 years, he taught real estate and finance courses as part-time lecturer at CSUN. He became a full-time faculty member in the Department of Business Law in 2015. On the same year, Ray earned his Ph.D. in policy planning and development from the University of Southern California's Sol Price School of Public Policy. "CSUN really impacted my life," he said. "Faculty really cared about us, and [they] were really practical. Several of my professors in the business school were practitioners in addition to being instructors. This practical experience provides students with a greater insight into how the real world works and better prepares them for a career. I was fortunate to have some instructors that didn't just provide theory, but also provided real-world experience. I actually took over my real estate professor's position here at CSUN, and working in real estate changed the direction of my life." In 2004, Adina earned her bachelor's in accountancy and earned her bachelor's in finance the same year.She went on to become controller of a private company in the San Fernando Valley, but she also wanted to continue her education. In 2017, she received her master's in accountancy. The new scholarship will make a difference for current and future Matadors. "We chose an endowment because it's perpetual," Adina said. "We want to leave this place better [for Dreamers and other students of undocumented status]. We hope that this endowment will be something that will go on, and even encourage other faculty to give back." "This university really gave us the opportunity to have the life that we wanted," Adina continued. "Education really changes students' lives." For more information on contributing to scholarships for CSUN, please contact Jerry De Felice at jd@csun.edu or 818-677-3935.